Accepta 2320 comprises a multi-treat blended liquid formulation based on organic tannin, polymer sludge conditioners and alkali. Accepta 2320 can be used either by itself or in conjunction with other supplemental treatments to give a balanced treatment programme. 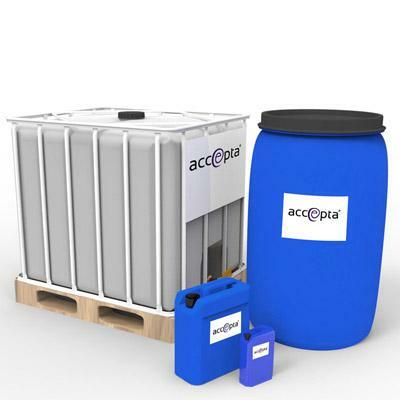 Accepta 2320 does not add substantially to the closed system water alkalinity and is ideal treatment in boilers which are susceptible to foam formation. Accepta 2320 controls corrosion by the dual mechanism of oxygen scavenging and the formation of a corrosion resistant tannate film. It prevents scale formation by converting residual hardness salts to a mobile non-adherent sludge that can be removed by blowdown in boilers. Excellent tannin based scale and corrosion inhibitor for closed loop systems. Does not add substantially to water alkalinity. Ideal for boilers susceptible to foam formation. Accepta 2320 should be added to the system at an initial dosage rate of 1 litre/ 1000 litres of system water content whenever the system is drained or loses a significant quantity of water then the additional the chemical should be added at the rate of 1 litre / 1000 litres of water added.